Brenham City Hall is located at 200 West Vulcan Street, Brenham, TX 77833; phone: 979-337-7200. Photo: Brockschmidt-Miller House, ca. 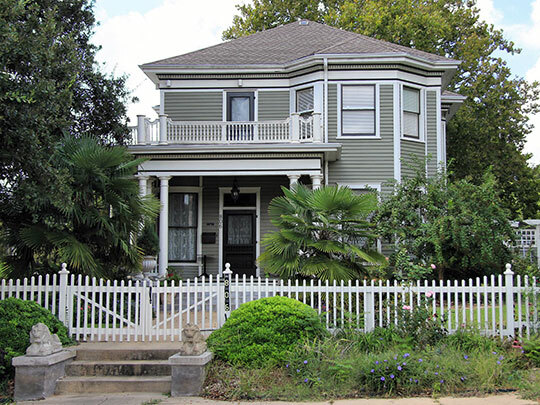 1901, 806 South Day Street, Brenham, TX. Listed on the National Register of Historic Places in 1990. Photographed by User:Larry D. Moore (own work), 2013, [cc-by-3.0 (creativecommons.org/licenses/by/3.0)], via Wikimedia Commons, accessed August, 2014. In 1843, the residents of Hickory Grove adopted a new name, Brenham, in honor of Dr. Richard Fox Brenham (c. 1810-1843). Dr. Brenham, who practiced medicine in the vicinity some years earlier, achieved fame as the martyr-hero of the ill-fated Mier Expedition to Mexico in 1842-43. It was a tribute to his courage that the inhabitants of Hickory Grove renamed their community in his memory. A year later residents of Washington County decided to select a permanent county seat by popular vote. Mount Vernon (the original county seat), Independence, Turkey Creek, and Brenham vied for the honor. No single community, however, could get the required majority vote. Turkey Creek and Mount Vernon withdrew from the race leaving the choice between Brenham and Independence. Jabez Demming Giddings (1814-1878), an early resident and lawyer of Brenham, toured the county making speeches on behalf of the Brenham bid extolling its virtues as being the logical place for local government at the center of the county. On February 4, 1844, voters selected Brenham by three votes as the permanent county seat. Utilizing 100 acres of land donated by Jessie Farral and James Hurt, the Congress of the Republic of Texas designated commissioners to survey the townsite and sell lots so that the nucleus of the town could be quickly established. The town was laid out in a grid pattern around a central square, Shelbyville plan, with streets intersecting at each corner. The new community developed around the square and its transportation routes radiated from it. The road at the northwest corner led to the old communities of Independence and Washington-on-the-Brazos while the road from the northeast corner, along Market Street, led to Chappell Hill and Houston. The southern part of the county and Austin were accessed by roads from the southeast and southwest corners, respectively. This town plan allowed access from all parts of the rural county and thus the central square became the location of the first county courthouse, a simple two-story cedar structure constructed in 1844. In late 1844, Brenham consisted of six houses and a log school house (Hickory Grove School or Academy) one-half mile north of the courthouse. (Brenham News, January 27, 1916) By 1852, the first courthouse was inadequate for the needs of the growing county government and a new two-story building was constructed by John Stamp using Brenham manufactured brick. Secure in its position of political importance, the future prospects of Brenham as an agricultural and commercial center were better than any other town in the county. Many residents from other county towns, sensing that Brenham was a key commercial and political center, sold their homes and moved into the area. The greatest impetus for growth, however, came from the continued waves of immigration of Lowland South Anglo-Americans with slaves and later some Germans settling in Brenham and Washington County. Dwayne Jones, Preservation Planner and Sally Victor, Texas Historical Commission, Historic and Architectural Resources of Brenham, Texas, nomination document, 1984 & 1989, National Park Service, National Register of Historic Places, Washington, D.C.